Bright & inviting two storey home backing onto parkland with a beautiful view. Recent updates include flooring, heat pump, kitchen counters, paint & more. Bright open kitchen with large patio doors leading to a fenced backyard. Storage pantry & laundry off of the kitchen. Large living room with big windows & patio off of the front. Huge master bedroom with vaulted ceilings, large walk-in closet, 4 piece ensuite, small patio & skylight. Two other spacious bedrooms up & 1 spare bedroom down. Built in vacuum & in ground sprinklers. 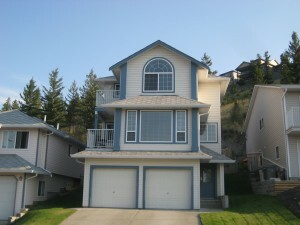 Large 2 car garage & lots of storage space.